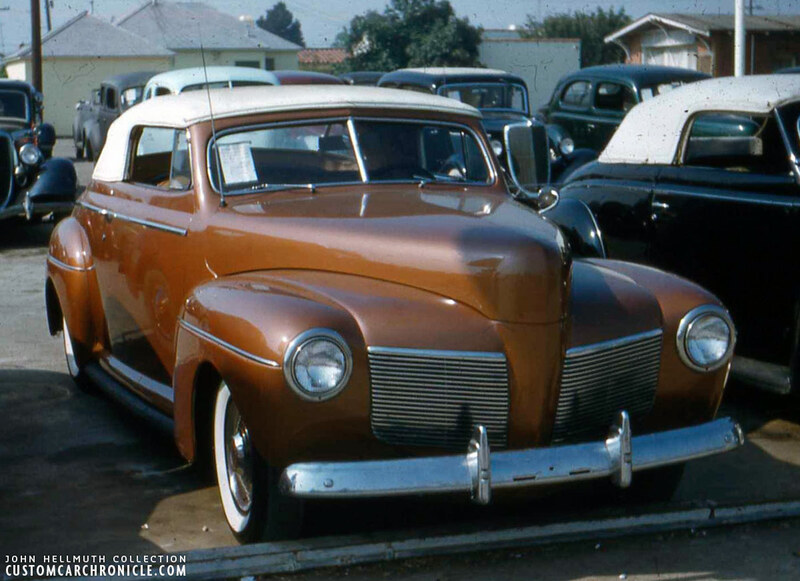 In the 1940s and 1950s there were several second hand Hot Rod and Custom Car lots around. Custom City was one of them. 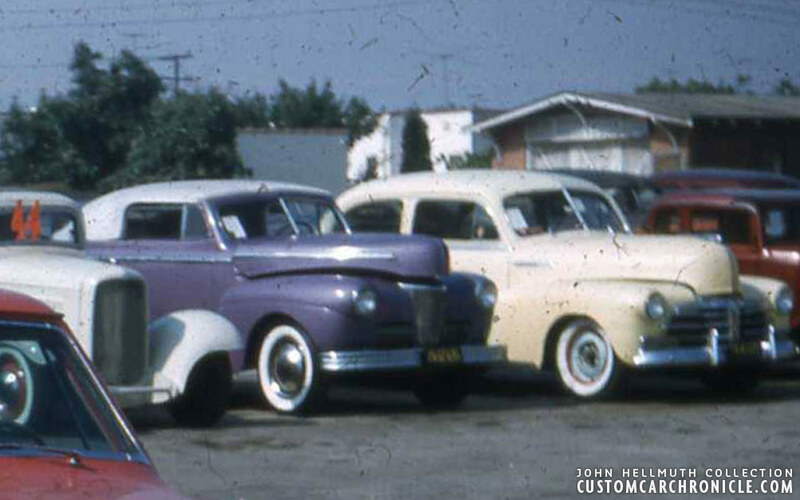 John Hellmuth shared some color slide taken at the lot in 1955. 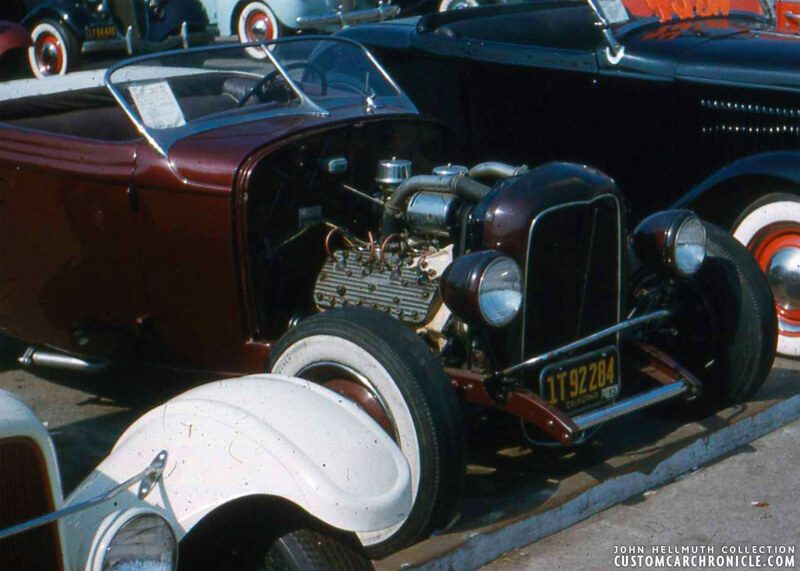 In the summer of 1955 the Hellmuth family from St. Louis decided to make along road trip to see some relatives out in California, to visit the grand opening of Disneyland, and for their sons Bob and John to see some Hot Rods and Custom Cars on the street. They took their family’49 Dodge Wayfare, loaded in their luggage, four kids, Mom and Dad and took road 66 down to California. 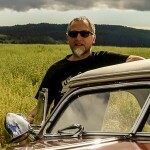 It took them 5 days to get there, enjoying the scenery and some Hot Rods along the way. 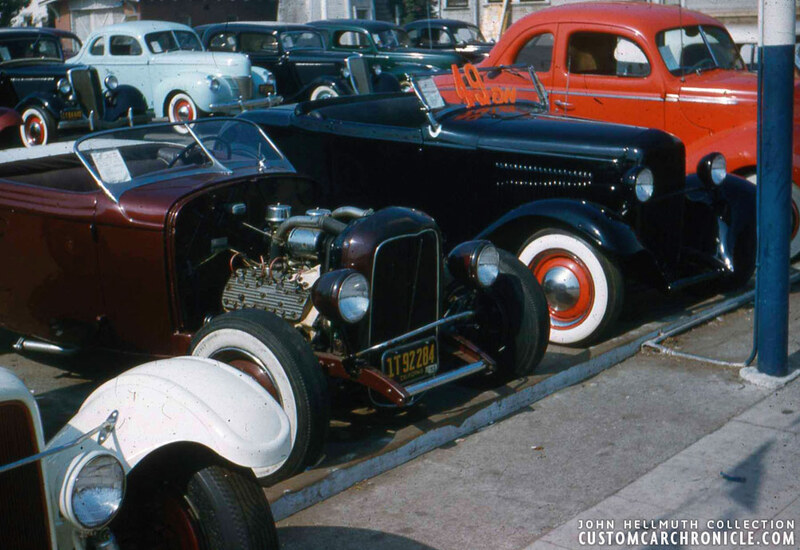 After arriving at their family in Culver City John and his brother Bob took the car and started to drive around to find Hot Rods and Custom Cars, those cars they had seen in the magazine. 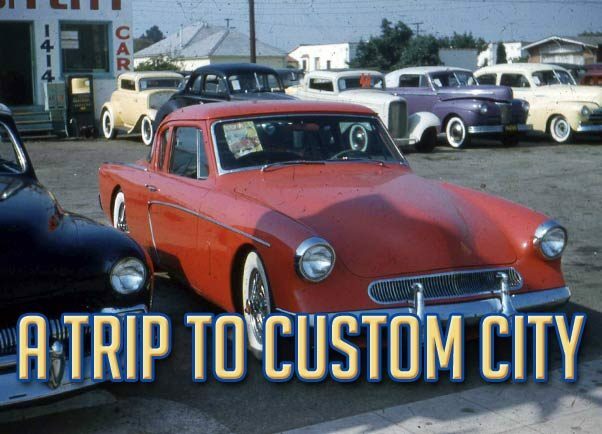 While cruising around in Los Angeles they came across the Custom City Car Dealer specializing in Hot Rods and Custom Cars not to far from LAX. The stopped the car to check out all the candy in the dealer lot. The owner was a nice guy, and let them hang around, check out all the cars and take as many pictures (color slides) as they wanted. 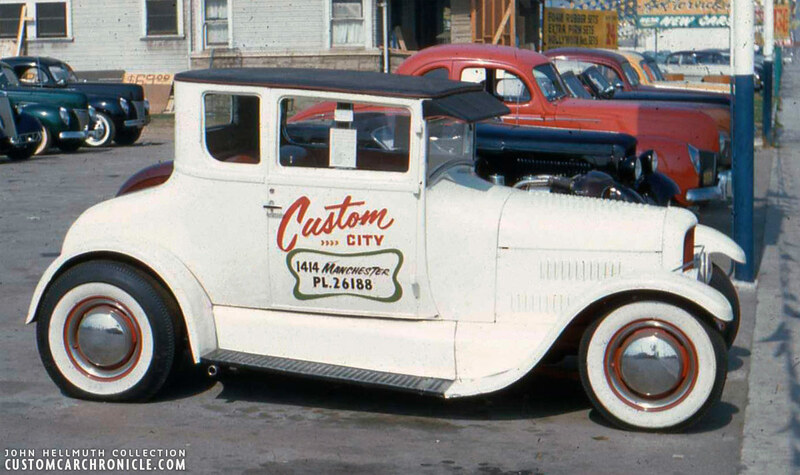 The first color slide that John shared was this one of the Custom City advertising chopped T and a series of Hot Rods and Custom Cars parked in line on the lot. To bad we cannot see more of the signs in front of the lot on Manchester Ave. 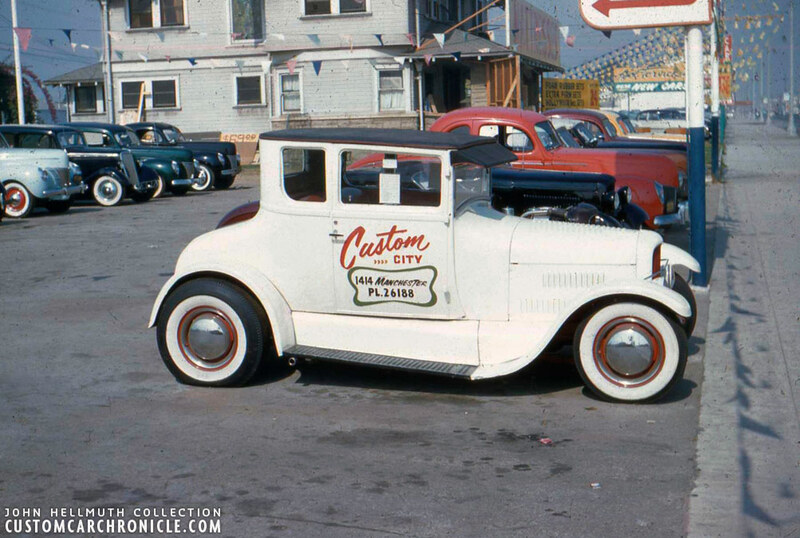 The Custom City used Hot Rod & Custom Car lot was located at 1414 Manchester Ave. in Los Angles. Assumably this shop used to be the well known D & B Auto Sales on Santa Monica Blvd. In 1954 original owner of this lot, Don Britton, had sold it to Marv Gelberg and Park Dana who renamed it Custom City. The Custom City on 1414 Manchester Ave., the one we can see in this article was mot likely related to the one on Santa Monica Blvd. D & B used to advertise their business in the local papers and national magazines, but from the Custom City lot we have not been able to find any advertising so far. On the Custom City lot there were a number of great looking cars the day Bob and John Hellmuth visited it. Good looking cars by todays standards, probably selling for relatively little money in 1955. 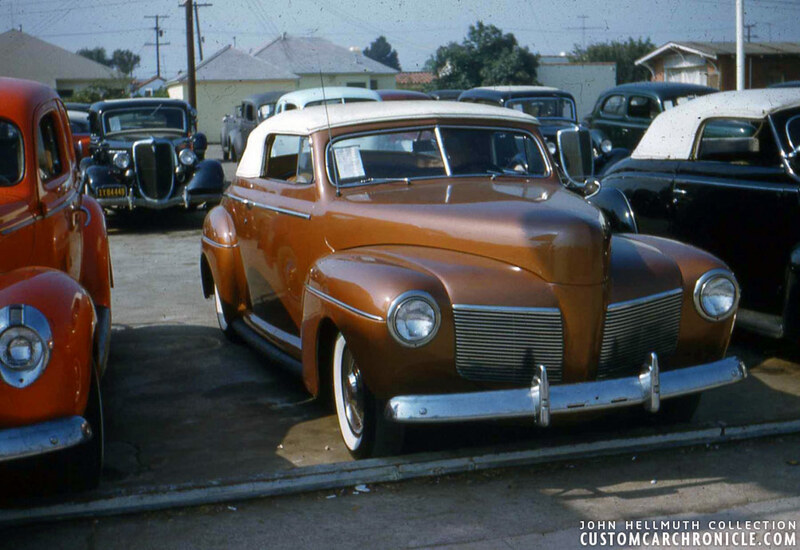 Just because they were considered outdated… which was especially the case for the Custom Cars in the lot. Close up of the great looking chopped T Coupe with ’32 Ford grille, white wall tires, red wheels with ’50 Merc hubcaps. Painted white and used as Custom City advertising. Probably rolling as well as parked in front of the lot towards Manchester Ave.
My personal favorite photo is this one showing a beautiful mid 40’s styled restyled 1941 Mercury convertible with chopped padded top. Parked next to the ’41 Mercury is another chopped Mercury Convertible with padded top, this time a ’39 Mercury (no vent windows) with its rear window flap removed. The dark green ’40 Ford two door sedan in the back looks very nice as well. Close up of the 41 Merc shows the unusual shortened side trim, smoothed hood and what appear to be 53 Mercury hubcaps. Other modifications are the 46 Ford bumpers, the chopped windshield with padded top with three piece panoramic rear window. 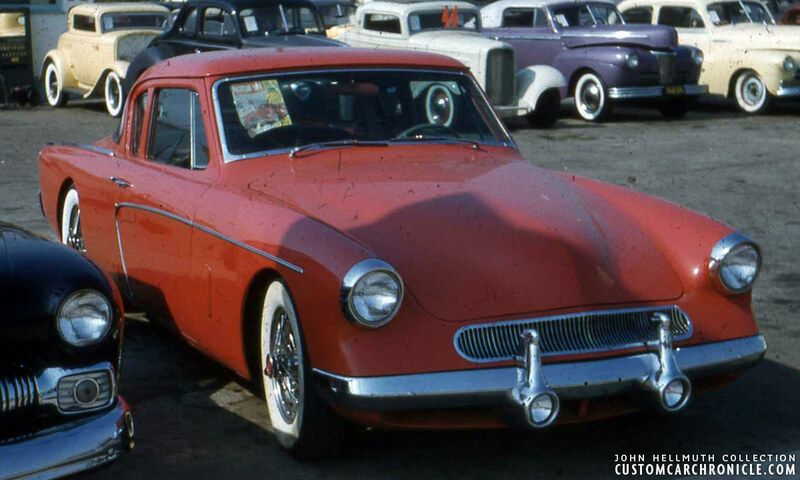 This was a very fine Custom, possibly slightly updated (hubcaps, and sans fender skirts) along the way, but in 1955 this style custom was very much out of style. I wonder how much the asking price was, and what ever happened to it. Parked next to the white chopped T Coupe from is this 1932 Ford ex-cabriolet turned roadster. Even back in 1955 this was a hot looking Hot Rod. The all black ’32 Roadster with red steelies and white wall tiers looks stunning as well. Don’t forget to look at the cars in the back row. Close up on the ’32 Cabriolet shows that it has some very nicely done body work required to make the DuVall windshield work with the cowl. The license plate has ’53 tags on it. Makes me wonder if it has been parked here since 1953. Ardun powered heavily chopped pale yellow ’32 Ford Coupe. Perfectly styled and proportioned. Makes you wonder why it was not parked out on the front row, where everybody could see it from the street. 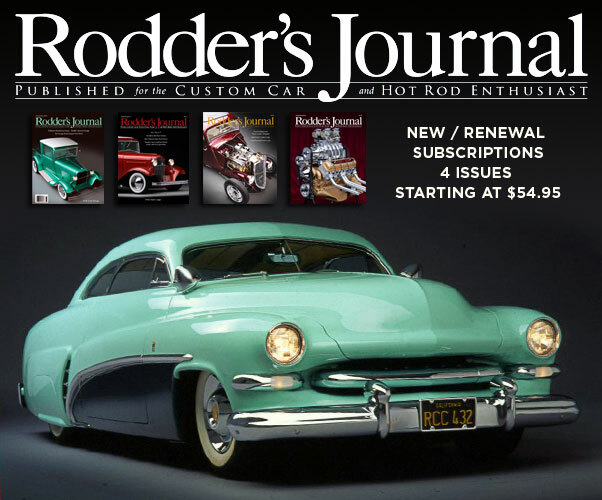 The one car that the brothers recognized from the magazines was this ’53 Studebaker restyled by the Valley Custom Shop. It was parked on the front row, on the other side of the entrance of the lot. 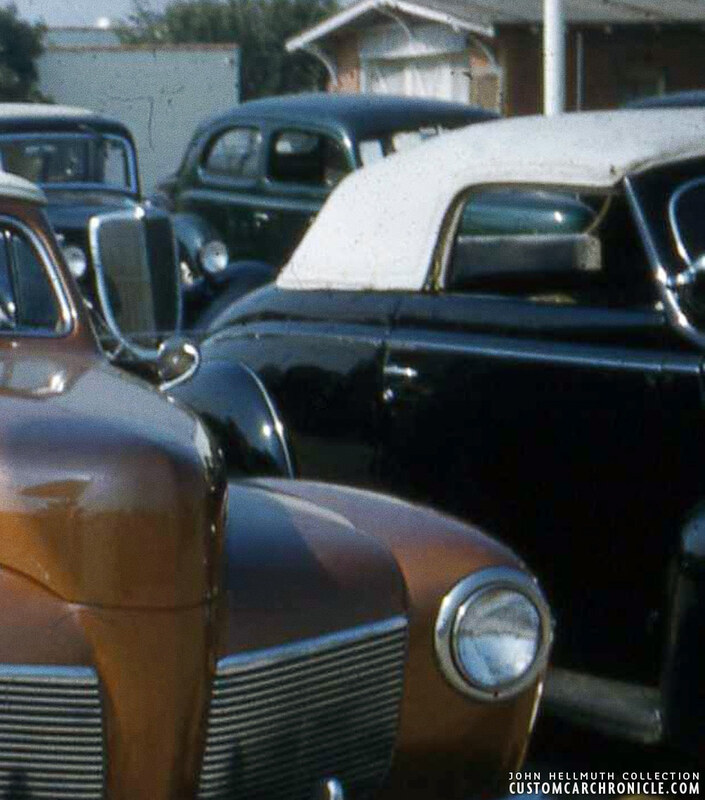 Zooming in on the cars in the background sow another mid/late 40’s styled ’41. This time an ’41 Ford convertible with smooth chopped padded top, ’49 Plymouth bumpers and lavender paint. 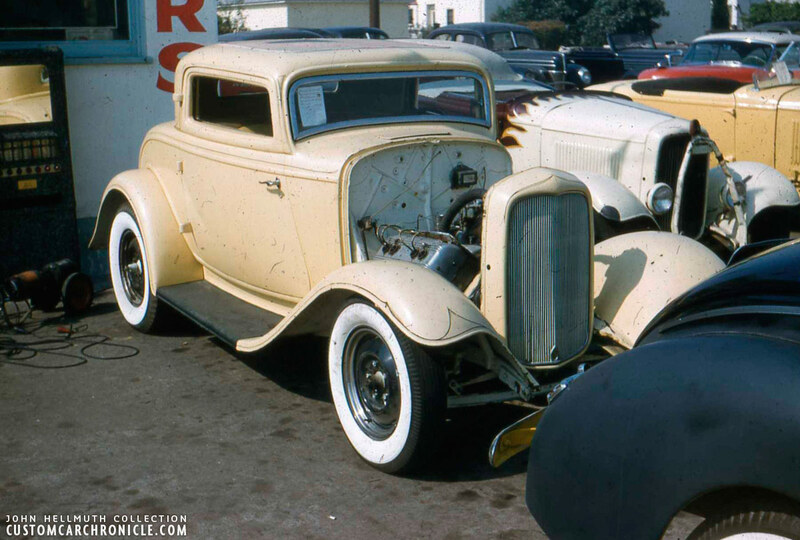 The ’32 Ford Chopped coupe parked next to it looks very modern with its headlight bar missing. Close up on the ’53 Studebaker “Stude Italia” created by the Valley Custom Shop in Burbank for owner Stan Mashbum. Those Studebaers came from the factory already beautiful, but the Valley Shop was able to make it looks even nicer. Two years after it had made the cover of Motor Trend magazine is was on the Custom City Second Hand Lot! 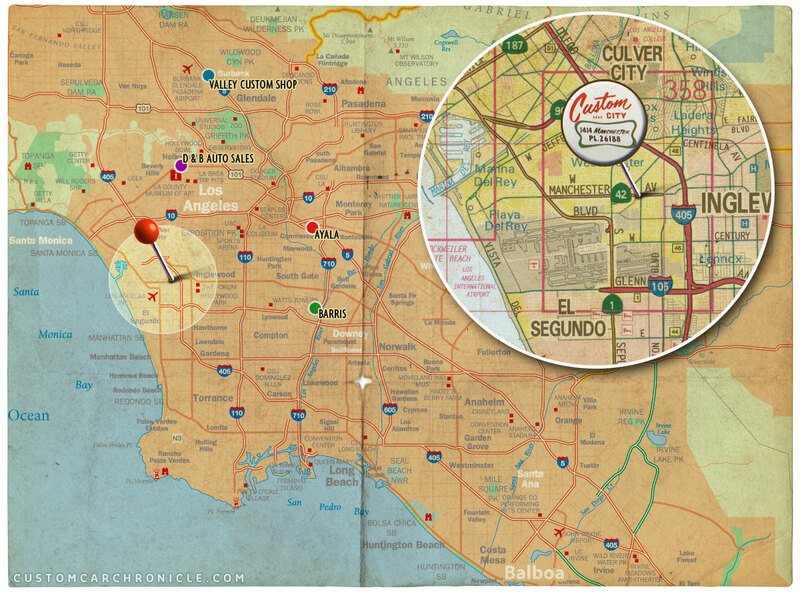 Locations of the Custom City lot (red pin) the D & B Auto Sales in Hollywood, Valley Custom Shop, and for additional distance info the Barris (Atlantic Blvd) and Ayala shops. So glad the CCC and its contributors are helping us get it back together. I see these pictures and I almost feel like I’m looking at still shots from a fake dream. I can’t even imagine what it would be like to go back in time today and scoop up even one of the cars sitting there for sale. Our present-day mindset can’t comprehend how someone could pass up such bitchin cars that seem so ready to cruise, but ever-changing trends dragged people’s tastes along with them. 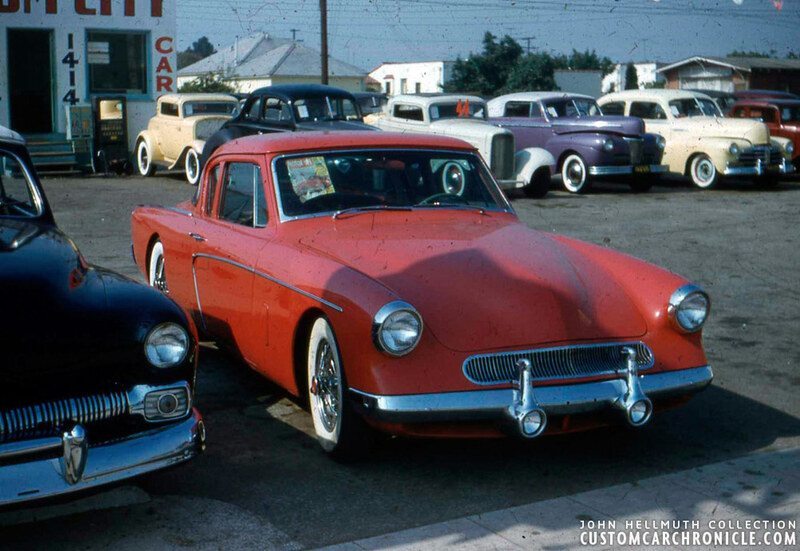 Even that Valley Kustoms Studebaker was still a freshly-built car with timeless style…and a cover car- sitting on a used car lot! Then again, the Hirohata was bought by Jim McNeil on a used car lot. I’m assuming it is the same Don Britton who owned the sectioned shoebox Ford? This would have been mid-July of ’55 if they were in town for the Disneyland opening (July 17th, 1955). If you google map the address, it comes up as 1414 East Manchester now…really hard to tell what the current location looks like, but you can see some old houses in the background. Thanks for the great pics and dialogue.